Dad & I left the water treatment work behind to check out the water fun stuff in Madison on Friday. Hosted by Rutabaga paddlesport shop, Canoecopia is a vendor expo offering everything from canoes and kayaks to Uncle Red Beard’s fishing tackle. We stopped at the Bear Paw Outdoor Adventure Resort and chatted with old friends. We lusted after beautiful wooden canoes and real estate listings of remote northwoods cabin properties. After stopping by the fourth Boundary Waters Canoe Area outfitters booth, we hatched a plan. If we could get a few more people interested in going, we would finally plan the boundary waters canoe trip we had always talked about doing. 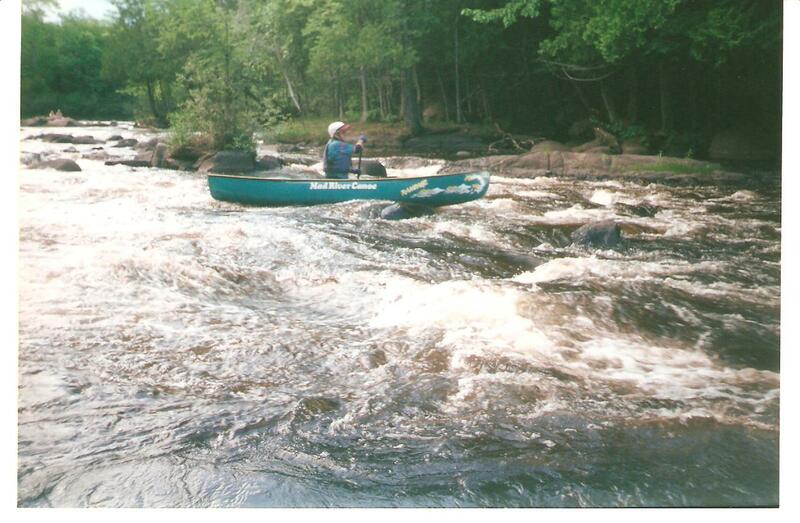 We usually paddle section 3 of the Wolf River in northeastern Wisconsin, a beautiful scenic stretch of river with alot of class 2 and a little class 3 rapids. I’m talking whitewater here. Lots of rocks, some cursing, and an occasional capsize followed by a cold swim that can leave ugly bruises. But a few days in the boundary waters, full of wildlife, campfire breakfasts and the possibility of seeing the northern lights has always intruigued me. So now we are dreaming and planning, and hoping that we can have the chance to leave the water work behind for a few days and have some water fun up north this summer. Wouldn’t it be great if you could just filter your water at home and know that is was as pure as you can get it? And what if you could have that water tested to prove it? If you could just have a stylish little extra faucet in the kitchen that gave you an almost endless supply of that clean water! And wouldn’t it be great if that same pure water could be supplied to your refrigerator’s icemaker and water dispenser? It would be nice to stop worrying about running out or rationing it like you would with bottled water. You could cook with it, make your coffee with it, give it to the animals and even fill your aquarium with it! Man, if someone would just invent a device that would fill all of these requirements, make it more convenient than bottled water and cost just pennies per gallon…wouldn’t it be great? Wow, its been a while since I have posted here…things have been busy and when you are juggling 73 things at one time, you are going to drop something. Or several things! Something we have been busy with is planning an open house party to celebrate 25 years in business. Here is your personal invitation…. We will be serving food and cake, and there will be prize drawings (donated by some of our great business customers) and a super sale on water softener salt as well as special event pricing on water softeners, filters and drinking water systems. Hope to see you there, we are so thankful to have such great customers and friends – we know we would not be here without your support. Wow, the time flies. Summer is over and autumn is in full swing. Has it really been 3 months since the company birthday party? I looked at the calendar and realized that the fairs & festivals are done, vacations have all been taken and Thanksgiving is only six weeks away. And I still haven’t gotten that garage cleaned out. The biggest event this summer at American Water Treatment was the celebration we held for our 25th anniversary. We had a party in late July and many of our friends, family and customers came to join us in marking the occasion. There was good food, fun and cake! We were especially honored that Sen. Dave Syverson stopped by to wish us well and humbled by the fact that so many of our business customers donated items and gift certificates for us to give away in our prize drawings. A good time was had by all and we are so thankful for the great turnout for the party. Early on we landed one of the biggest projects we have ever done, supplying water treatment components for the Nicholas Conservatory under construction at Sinissippi Gardens. Congrats to Russ for making that happen, along with everyone else’s hard work and borrowing a trailer from Chris & Jessica at MP Heating & Cooling in order to deliver it! We also celebrated our 25th year in business with a huge party in July and hosted a business afterhours for the Roscoe Chamber in October. We started advertising on the Michael Koolidge show on WROK, Russ completed his continuing education requirements for his WQA certification and I was appointed to the Roscoe Chamber board of directors. I also got my name and/or picture in the paper a few times! As usual, Eric & Russ worked their butts off servicing and installing equipment and our increased DI exchange services and salt & water delivery business was handled easily by Chad. And of course, Sherry kept everything working smoothly on the administrative side. Looking at the numbers and taking into account the economic “recovery” that is supposedly happening, we had a solid year. So what do we have to look forward to? What are our goals for the coming year? I think an area of concentration will be increased customer service and education. We are so grateful for the referrals our customers have given us and they will keep coming if we go above and beyond expectations. Our expanding commercial service has been a nice suprise and we will definitely pursue more opportunities in that area. Of course, we will be exploring new ways to increase sales and service and may be looking at adding personnel to help achieve that. So, Happy New Year, everyone! Today is the first day of the rest of our lives, right? Let us march forward, confident in our goals and our abilities to reach them. I couldn’t afford the tow, so I just made it into a lawn ornament. 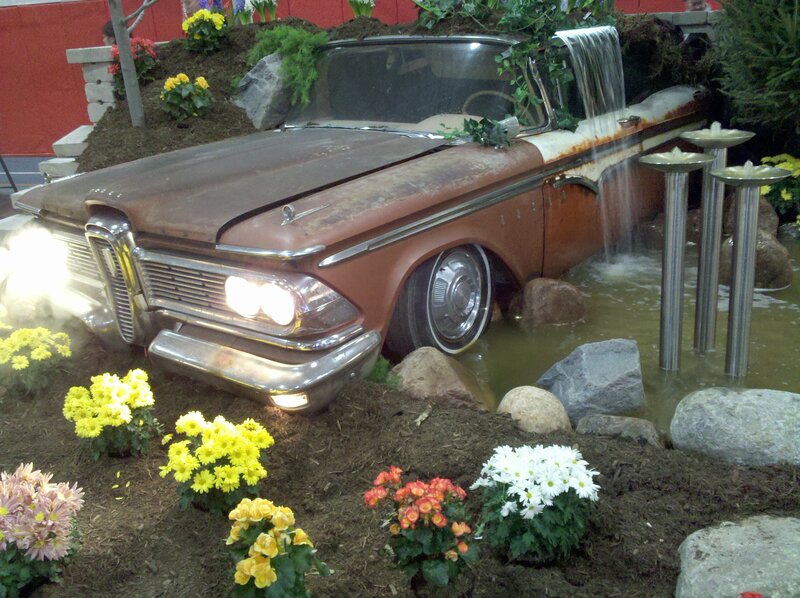 The Rockford Home Show is this weekend, and I couldn’t be happier. Kids with balloon animals, long cold walks from the back parking lot, hours of bad jokes from my dad…I can’t wait. No, really, all kidding aside, the home show is a great opportunity to meet with people who are looking for our services. There is no substitute for a face-to-face conversation about a potential customers needs. That is what we are here for, but without the sideshow, would it be as much fun? Would I miss the busloads of seniors going from booth to booth like so many gray-haired pirates searching for booty of free pens and chip clips? Would it be as much fun without a certain hvac contractor harassing me via twitter about the score of the USA-Canada hockey game? Does the kitchen guy really think our spouses are meeting secretly behind our backs? Focus, Cindy, focus! Yes, the hours are long, and we try to amuse ourselves to pass the time between the rushes. It is all about the personal contacts & giving out our information, but I have a goal this homeshow…after every 5 appointments set, I am going to go get a free massage. And a balloon animal. American Water Treatment is now American Pure Water…read about it in our latest newsletter. Iron and rust and sulfur in your water can make your home a miserable place. But you don’t have to live with orange stains on fixtures, laundry and rotten egg smells in the shower, and you don’t have to live with the harsh chemical systems that some companies offer. There is a better way. The first step in finding the right treatment for an iron problem is a water test. The amount of iron in your water will dictate the size of equipment that will do the job. Iron starts to do its damage at .03 ppm (parts per million) and it is wise to place treatment before your water softener to protect it. Another consideration is the filtration media used to catch the precipitated iron. We see warranties on systems that run one to three years on the media. Sound ok to you? We guarantee our for ten years! What is the difference? Our media is lighter weight than competeing systems, and rinses and backwashes better than heavier filter media in other systems. Heavier media may eventually become a concrete-like mass, reducing your water pressure to nothing. If this happens, you are on the hook for the rebedding of the system to the tune of $400-$800…who wants to do that every four years? Our Iron Max system is the safe and natural way to rid your water of iron, rust, and sulfur. With no on-going maintenance costs, and an environmentally removal method, you can rest easy that the water your family enjoys is safe and clean. 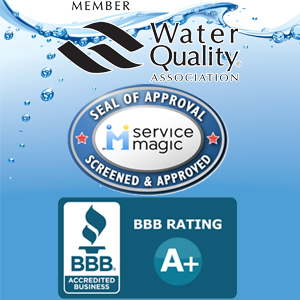 Our Water Quality Certified Water Specialists will test your water and get you the right sized system for your home and back it with award-winning service and the best warranty in the industry. Call for your water test today! Please let us know if you enjoyed this little water science lesson!